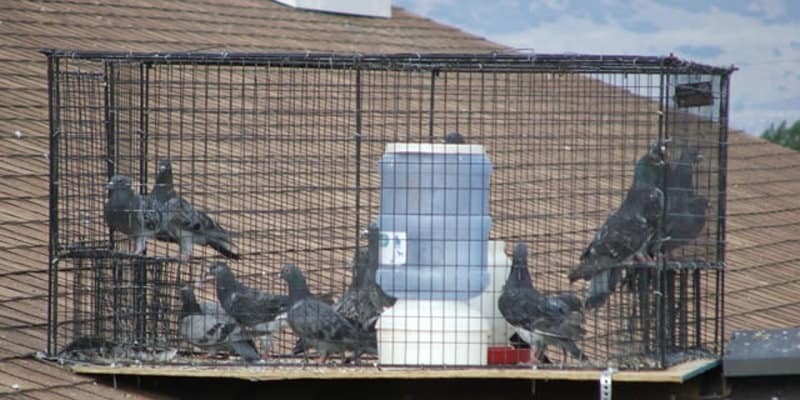 Pest bird trapping is in many instances the ideal approach to a feral pigeon problem. By quickly and efficiently removing a large number of these pigeons from your property, we’ll help you to take back your property from these troublesome birds. Wherever possible, we try to stop pest bird infestations from occurring in the first place. However, many people will only reach out to pest control companies when an issue has already set in. With feral pigeons, in particular, an existing infestation can be very tricky to tackle. In these cases, the best approach is often to trap and remove the pigeons to deal with the problem fast. Using large, automatic cages loaded with bait, the pest birds will enter of their own accord, and end up with nowhere to go. Our pest control technicians can then regularly come round and empty the cages to quickly cut down the number of feral pigeons infesting the area. Trapping needs to be done in the right way, and as trained pest control professionals, you can count on Pest Solutions to do exactly that. We follow all the necessary steps to ensure that our trapping work is carried out in the safest, most humane manner possible. We only use traps that have been fully authorized under government standards, to avoid causing any unnecessary harm or distress to feral pigeons inside. We also include enough food and water for them and check the traps every 12 hours to remove any birds that might be inside. But while trapping is entirely humane, that doesn’t mean it’s a soft option for pest control. Instead, it consistently delivers the optimum results and is thus suited for even heavy feral pigeon infestations. Pest bird trapping is highly effective in quickly reducing bird populations in areas where shooting may not be possible. For instance, in places like schools or large public spaces, there are too many health and safety concerns for shooting to be truly practical. On the other hand, trapping is completely unobtrusive, since the traps are placed well out of reach. This means that the feral pigeons can be dealt with without the people below even knowing the traps were there in the first place. Trapping is therefore a quick and discrete way of tackling even large feral pigeon infestations across a wide range of different locations. How Does the Trapping Process Work? The trapping process begins by installing the pest bird traps throughout the affected area and baiting them with food. We don’t activate the traps at this point, since it’s important that the birds become accustomed to them. Otherwise, we might only catch a handful of birds, as the others will be scared off or too wary of the traps to enter them. Instead, the birds will gradually learn that the traps are an easy source of food and therefore become desensitized to them. It is at this point that we begin to activate the traps. The feral pigeons will enter expecting to get an easy meal, and then suddenly find that the way out of the trap has slammed shut behind them. Our pest bird trapping programmes typically last for 6-8 weeks. This gives us time to trap most of the feral pigeons in an infestation and reduce the numbers of those remaining to an insignificant level. Once the pest bird trapping programme is over, you will naturally want to be sure that the problem isn’t going to simply return the next time the nesting season comes around. For that reason, we highly recommend following up bird trapping with additional preventative measures. At Pest Solutions, we have a wide range of different methods at our disposal, ranging from bird nets and spikes to bird free gel and bird scaring systems. This enormous selection allows our expert pest controllers to come up with a tailored approach to deliver the very best results for your individual premises. Get Rid of Feral Pigeons Today- Call Pest Solutions! If pigeons are causing problems on and around your property, then you don’t have to put up with these issues any longer. Contact Pest Solutions today, and we will be more than happy to take care of everything for you. To decide whether or not pest bird trapping is the right approach for you, we are delighted to offer a free, no-obligation survey. This helps us to create a plan of action that will virtually eliminate the issue of feral pigeons and ensures we can provide you with an accurate quote up front. Pest Solutions are the pest bird control experts, so you can count on us to deliver top-quality results. Simply call us now on 0800 027 2555 to arrange a FREE survey or a service call out. In next to no time, we will be able to drastically reduce the number of feral pigeons in your area- so there’s no reason not to contact Pest Solutions today.